"Play History. Make History." The marketing tagline for the 2018 release of the PlayStation Classic highlights an added attribute of the miniature console in the sense that all 20 games included may not actually be classic PSone games, yet even the less worthy inclusions provide gamers with a snapshot of playing through the history of Sony's first PlayStation. 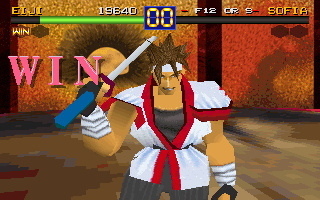 Before we slice apart Tamsoft's Battle Arena Toshinden through hindsight as being an average weapons-based fighter, it's worth noting the historical significance as it was the first ever 3D one-on-one fighting game on PlayStation – since Battle Arena Toshinden's Japanese release in January 1995 was three months earlier than the PSone port of Tekken. 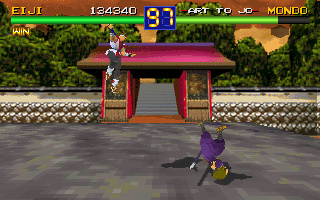 Anyone who can recall gathering around a Virtua Fighter arcade machine in late 1993 with mouths agape – recollecting that initially witnessing polygon 3D fighters and arenas was arguably even more unique than racers, since polygon graphics for racing games had more precedence in late 1980s titles like Hard Drivin' – so older gamers may also remember how Battle Arena Toshinden was heavily praised for its visuals in 1995. For example, the March 1995 review in Issue 18 of EDGE magazine scored the game eight out of ten and described it as "Toh Shin Den is simply gorgeous". Yet, time has not been as kind to the graphics of most PSone launch games. This is exemplified through chunky textures and basic backgrounds, such as the blocky, brown drab hills and mounds for both the American miner Rungo Iron's desert and Eiji Shinjo's settings or Kayin the Celtic buccaneer's blurry night-time city. Within 25 minutes you will have beaten all eight starting fighters to face the final boss Gaia, against a surreal backdrop that swirls around in an eye watering vortex. How much you appreciate the artistic design and charm in Battle Arena Toshinden's visuals as an early 1995 example of 32-bit graphics depends upon your ability to reminisce and forgive the fact that technically impressive 3D games at the dawn of the fifth generation simply may not have aged as appealingly, or might move less fluidly than high-standard 16-bit pixel-art titles. 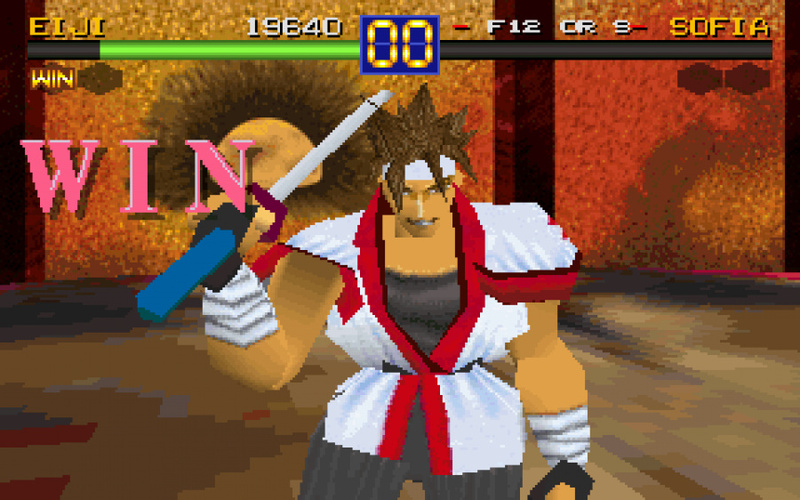 Push Square's editor Sammy Barker described it succinctly in his detailed PS Classic hardware review by explaining, "In games like Battle Arena Toshinden, a launch title for the PlayStation – and not a very good one at that – you can almost slit your wrists on the jagged edges, as boxy character models float around pixelated arenas". Altering the game's Camera Action options reiterates Sammy's point, as the Overhead viewpoint is unplayable, and the Sky camera results in minuscule characters. Surprisingly, the Long angle is actually helpful for avoiding ring outs, although it showcases how bland and empty the space is between each arena and background. The way in which you approach attacking and defending against a ring out is just one example of taking a strategic approach to the gameplay in Battle Arena Toshinden. The game's most innovative and enjoyable addition to the fighting genre is being able to circle your opponent by side-stepping using the shoulder buttons and triggers, especially since a counter-attack will cause more damage from behind. Mixing up strategies of blocking, dodging to avoid attacks, throwing distant special moves and double-tap running to charge an opponent with a close-up assault is a fun way of maintaining variety in the gameplay mechanics, especially in a two-player fight. You will have to change your fighting style and alter combinations against a variety of combatants, for example Turkish circus performer Ellis is fast and agile, while Japanese mercenary Mondo has a long reach to impale you on his spear, and initial boss Gaia is fierce and powerful. 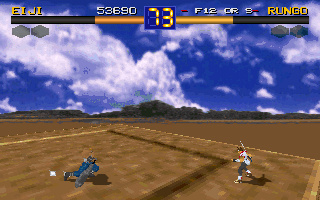 As is repeatedly the case with PSone games, the music by Yasuhiro Nakano, Makoto Mukai, and Fumio Tanabe in Battle Arena Toshinden has aged more gracefully than the graphics. The themes for Ellis, Russian agent Sofia, and the French nobleman Duke B. Rambert are merry, catchy, and get the toes tapping during each bout through the underworld. The tunes for elderly Chinese magician Fo Fai and Japanese warrior Mondo have an East Asian atmosphere, which fits well in a tournament of travelling fighters clashing weapons during the battle of the Immortals. The end credits track is elegant, understated and uplifting, too. Conversely, Gaia's theme marches you through the boss battle by building dramatic tension, as the solid and suitable soundtrack elevates your enjoyment of the game. This review of Battle Arena Toshinden was prepared by playing an original PAL PSone disc, and many gamers who first experience it on the PS Classic will notice it feels stodgy, because its slow movement is exacerbated by the PS Classic's inclusion of the 50Hz PAL version. Japanese adventurer Eiji Shinjo is the equivalent of an all-rounder character like Ryu in Street Fighter, so regardless of regional video standards executing moves like Eiji's Hadouken-esque, quarter circle Comet Strike feels slightly awkward, but accessible to newcomers. Beating the game gives instructions for a more complicated Super Attack, which acts as a desperation move when your life-gauge turns red. However, further delving to discover the hidden boss through harder difficulties without continuing reveals beating Eiji's brother, Sho Shinjo, and unveils a cumbersome Secret Move, because the input timing is sluggish and unresponsive when performing Super Attacks. It was unsurprising for fighting games to include limited content in the mid-1990s, but at least Street Fighter Alpha on PSone included a Turbo choice – even if there was still only two more than Battle Arena Toshinden's eight starting characters. Battle Arena Toshinden would have benefited from an option to change to a faster game speed. However, it's possible to unlock both Gaia and Sho Shinjo as playable characters in Tamsoft's game. 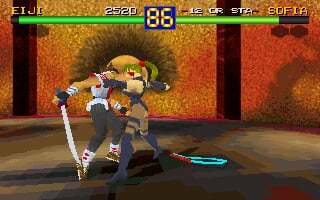 A year after its 1995 launch on PlayStation, Battle Arena Toshinden Remix was released on SEGA Saturn with an extra character, and more importantly a story mode, which is especially missed in the limited 1P Game or Vs Human options of the PSone original. This omission is heightened as the story would become expanded with an entertaining and bloody Battle Arena Toshinden anime film, which directly follows the first game, particularly in regards to the relationship between the fighters and the final secret boss, Sho Shinjo. It's apparent how strong the original character designs were by Tsukasa Kotobuki, because they translate well from the PSone game to the anime. 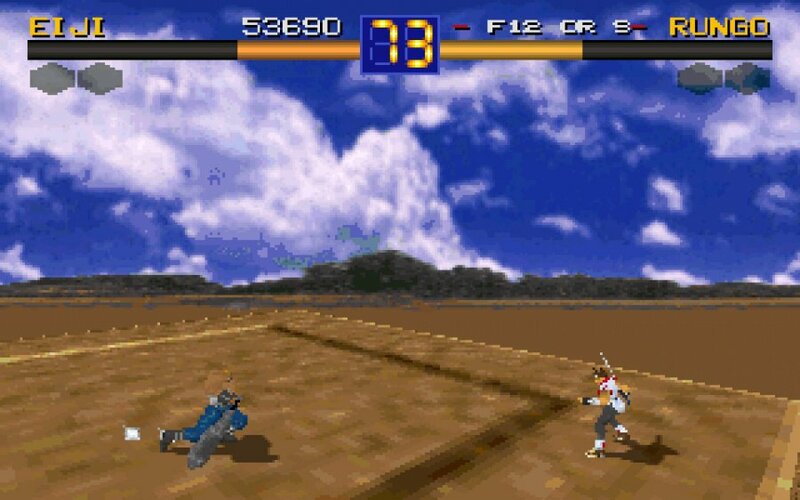 Ultimately, with three other sequels on the PSone, the first Battle Arena Toshinden is too bare bones and scant in its extras to stand out amongst a crowd of one-on-one fighters. Even games like Tobal No. 1 had an extensive Quest Mode on PSone, and Soul Blade was superior in the specific weapons-based genre. In Issue 137 of Retro Gamer magazine there was a 'How the PlayStation Changed Gaming' cover feature, where Nick Thorpe revisited Battle Arena Toshinden as a PSone launch game, stating that, "it just doesn’t play that well. It’s easy to see how Tekken became more popular". Consequently, Namco’s Tekken 3 almost seems like a generation ahead of Battle Arena Toshinden – even though they're both PSone titles – through its graphical presentation, cut-scenes and extra modes, like Tekken Force. 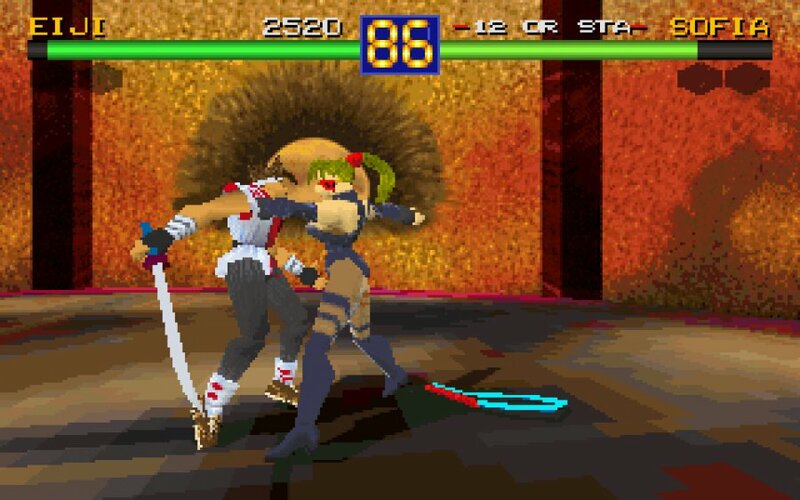 Tamsoft's Battle Arena Toshinden epitomises how the ageing process changed gamers' perspectives from being bedazzled by the outstanding 32-bit visuals of PlayStation's first 3D fighter in early 1995 to feeling unimpressed by primitive polygonal graphics as a PS Classic title in 2018. Its classic status is undermined by slow, unresponsive controls for moves like Super Attacks and sluggish weapons-based combat, as well as rudimentary gameplay options and no story mode. This is unfortunate, because an energetic soundtrack is a highlight, plus innovations like circling and counter-attacking opponents meant that Battle Arena Toshinden was not a load of old tosh. 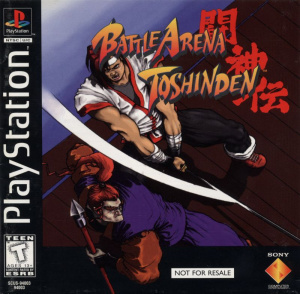 PSone was finding its feet in the fifth generation console face-off in 1995, so launch games like Battle Arena Toshinden have historical significance by ensuring that at the call of 'Bout 1, fight' Sony's first console came out swinging. @get2sammyb Thanks for another kind comment about my reviews, and cheers to you for again for the meticulous detail you put into your PlayStation Classic review. I thoroughly enjoyed reading it, and while I understand the mini console's shortcomings, your analysis still leaves me enthusiastic about jumping between the 20 PSone games like a retro gaming jukebox on Monday. @JamieO I think, knowing you, you'll really enjoy it. -- Cheat codes: I actually used cheat codes in PSone Battle Arena Toshinden to play as Gaia and Sho Shinjo for this review. -- Tamsoft: I don't know much about the Japanese developer Tamsoft, except that they make Senran Kagura games like PS4 Senran Kagura Estival Versus. Incidentally, Battle Arena Toshinden was published by Takara in Japan, but by SCEE in Europe. -- The 5/10 score and difference between gamers praising Battle Arena Toshinden in early 1995, compared to people's perception of the game today: I definitely don’t want to stomp on anyone's nostalgia for this game with the average score. I've covered how magazines like EDGE Issue 18 rated it highly as an 8/10 in March 1995. 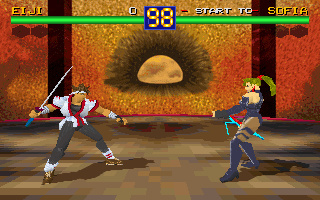 EDGE explained that the textures, graphical tricks and details in the backdrops were a step above Virtua Fighter on Saturn. I love the catchy music in this game, too. -- The 50Hz PAL version of Battle Arena Toshinden on PlayStation Classic: I played a PAL PSone disc in 50Hz, which should be a comparable experience to when I get the PS Classic on Monday. I remember first importing NTSC consoles in the early 1990s to avoid what magazines of the day described as a 17.5% drop in speed. This will affect the feel of a fighting game, especially in a slower paced title like Battle Arena Toshinden. I also love punk and alternative rock, so I included a reference to The Wonder Years 2011 song 'Came Out Swinging' in the last line of my conclusion. I’m working on my next PSone review, but I'll drop by here to read your comments. I'll also return to this comments section next week when the PS Classic has released, just in case anyone has extra thoughts once they own Sony's plug-and-play console. @get2sammyb @JamieO Can I just say that I'm loving all of the detail and attention you guys are giving these retro games. Playstation isn't just about looking forwards but of the amazing games and consoles that formed the foundations of what we have today. And I personally appreciate what you're publishing at the moment. All the screenshots in the review come the PC version of the game running in low resolution (the PC version has four screen resolutions). Not the PS1 version. @KingdomHeartsFan I absolutely love being able to review PSone games for Push Square, and comments like this make it even more worthwhile. @Deljo You'll probably find that Battle Arena Toshinden is still fun for a quick play-through on your PS Classic over Christmas. I'm sure that anyone who developed skills from playing it at launch will be able blast through Normal difficulty and beat Gaia in less than 25 minutes. Take into account that when I review a game I’m careful to follow Push Square's scoring policy, and I compare it to other games in that specific genre on the same console. Therefore, it's harder for a launch game to stand the test of time against titles from later in the generation — especially during the 32-bit era as games were evolving quickly and exploring the possibilities of 3D graphics — plus when you factor in so many revered classics in a large library. Hopefully, if you rekindle how you felt about the original PlayStation's launch, with a bit of nostalgia you'll still find plenty of charm in the visuals and especially the music, so it'll recall good memories of gaming in 1995. @Verm I didn't even realise it was ported to PC, I wonder if that means PC gamers can still download and play it, because I think it's a shame that PSone Battle Arena Toshinden is not available for PS3 and PS Vita on the EU PS Store. I played the Platinum PSone PAL disc, boxed with instructions for this review. The instruction booklet was actually quite handy for character profiles, fighting strategies and a basic story overview. I also enjoyed watching the Battle Arena Toshinden anime to get a feeling for the larger story, too. Well, the PC port was somewhat buggy (notice how the characters react to multiple hits in the PC version) and largely visually inferior to the PS1 version. Toshinden 2 was also released for Windows PC, a near perfect port with many graphics options (such as the ability to run in whatever resolutions your computer can handle, I imagine including 4k etc). But you need a slowdown program to run it on modern computers as it doesn't seem to have an FPS limit. @Verm Thanks for sharing your knowledge about the PC version, I always enjoy learning new things about retro games, and I had no idea Battle Arena Toshinden was converted to PC. The last time I used a personal computer for playing games was on the Commodore Amiga 500 in early 1990, but I sold it to buy a Mega Drive. I should learn more about retro gaming on a PC, because I'm completely clueless, but I've heard that you can buy retro games from stores like Steam and Good Old Games (GOG). Your comment intrigued me, I remember that SEGA ported Saturn titles like Panzer Dragoon to PC in the late 1990s, but I don't know if many third-party PSone games arrived on PC. I noticed from your YouTube link that Battle Arena Toshinden on PC was developed by Digital Dialect and not Tamsoft, plus it was published by Playmates. This means that over time and across different regions Battle Arena Toshinden has been published by Takara in Japan, then by SCE in Europe and NA on PSone, as well as by SEGA for Battle Arena Toshinden Remix, and lastly by Playmates on PC. It makes me wonder which company holds the publishing rights for Battle Arena Toshinden today. 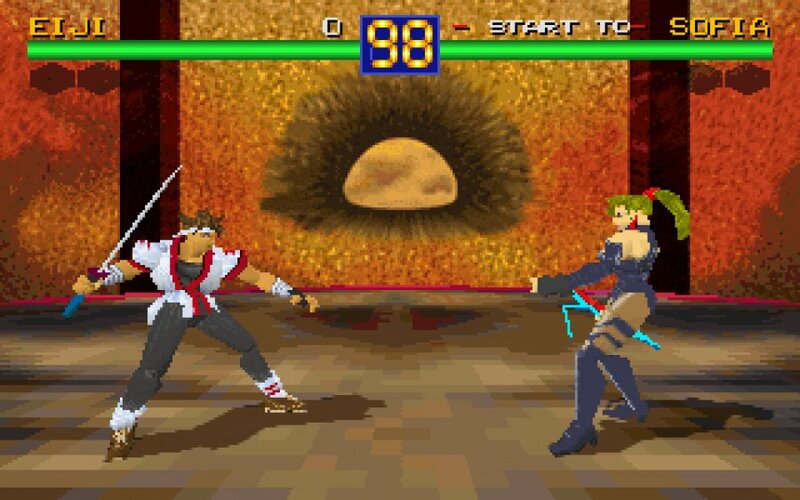 I don't know if Steam or GOG sell games like Battle Arena Toshinden to download for PC gamers to play in 2018, but I imagine retro gamers could buy the original PC disc from eBay and retro shops, if it's not too hard to run an older game. Since the PSone original is not on the EU PS Store, the PS Classic is a welcome way for gamers to play Battle Arena Toshinden again. It's great when I learn new things about retro games on the comments for my reviews, cheers! Loved this game from a demo, the music, still on my playlists. I traded out for the Saturn version in the end. I loved this game at the time, but it certainly has not aged well. Tekken is probably more fun and certainly more fluid. However, in its favor, Toshinden actually has more strategy and is much less of a button masher than Tekken.